Evolution Gym members are the best in the country and to test their mettle, fitness and tenacity we designed a 12 month challenge to find the best all round male and female athletes in the gym. Not only that it sets a personal challenge to everyone one of us to challenge ourselves to undertake events inside and outside our comfort zones. Not everyone can be a superhero but we can all learn new skills and be the best we can be in each event. Scores were calculated with 10 for a first place through to 1 point for 10th. Each month we had a winner, but the collection of points was the goal so you didn’t necessarily need to win to become the superhero but be consistent. Our first winners were Adam Walker and Nichola Fuller in the row back in January 2017. So after 12 months of gruelling events who were our SUPERHEROES? Well done to our 2017 Superheroes!!! The full table of everyone’s results will be up soon. Roll on the 2018 search. This entry was posted in Fitness and tagged Evolution Gym Sheffield, superhero, Team Evo on January 4, 2018 by billybicep. The Yorkshire and Derbyshire air ambulances are the reason we are taking to the mountains. Here’s a little information about the work they do and how they are funded (by people like you and me). We could need them at any time and as a team we have benefitted already from them saving the lives of our family and friends. 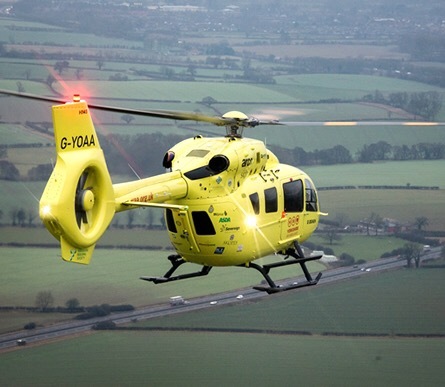 The Charity was set up in 2000 and with the addition of the second Air Ambulance in October 2007, we were the first Air Ambulance in the UK to own and operate a Dedicated Air Desk in the UK. With the addition of the Air Ways Communication Systems, the Yorkshire Air Ambulance has developed into a sophisticated emergency service that provides state-of-the-art emergency medical care throughout Yorkshire. The swift medical interventions provided by our Air Ambulance crews have a major impact on a patient’s chance of survival and subsequent quality of life. Yorkshire has a vast topography that not only includes remote, rural and densely populated areas but also includes major motorways and road networks such as the M62, M1, A1 and M18. The fast medical response that the Air Ambulance service provides is vital to a patient who has received major trauma, especially those with head and spinal injuries, as the Air Ambulance can avoid traffic congestion and uneven road surfaces. 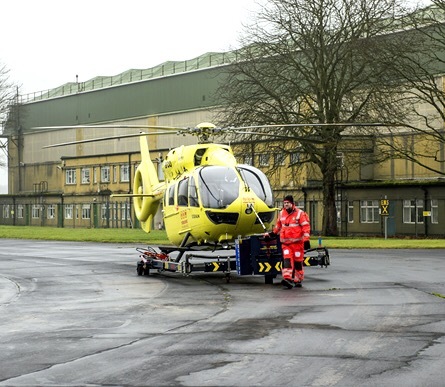 On average, when a patient has been received by the YAA, they will always be only 10 minutes from the nearest hospital and 15 minutes from the most relevant treatment centre. In some cases, this can save people’s lives. 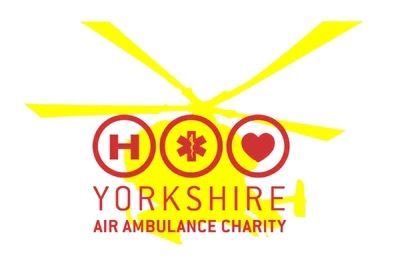 Both of Yorkshire’s Air Ambulances are Airbus H145’s, G-YAAC and G-YOAA. They’re each equipped with state-of-the-art medical and helicopter specifications. Both helicopters can reach speeds of up to 160 mph and together cover the whole of the region seven days a week, 365 days a year. 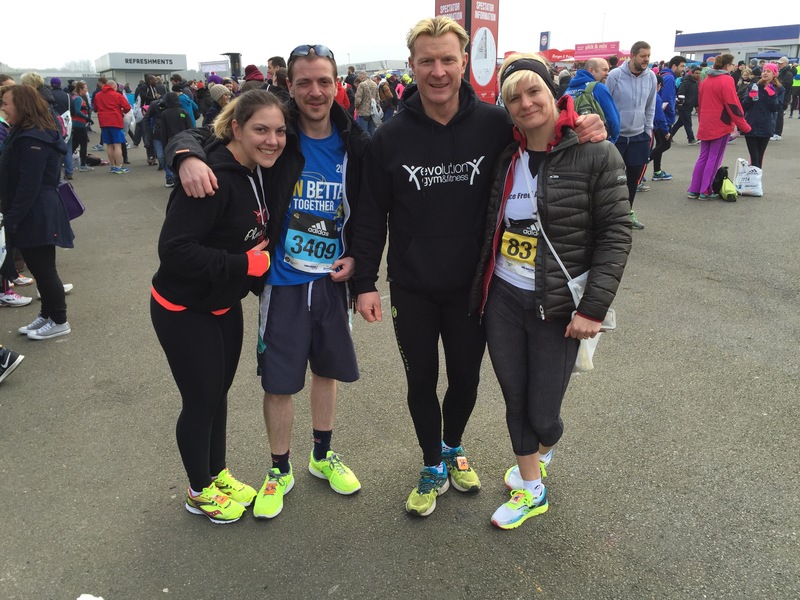 This entry was posted in General, Team Evo and tagged air ambulance, donations, Evolution Gym, fund raising, national three peaks, Team Evo on May 29, 2017 by billybicep. Well this weekend is a busy one for Team Evo activity. Competition season is underway for all sports. 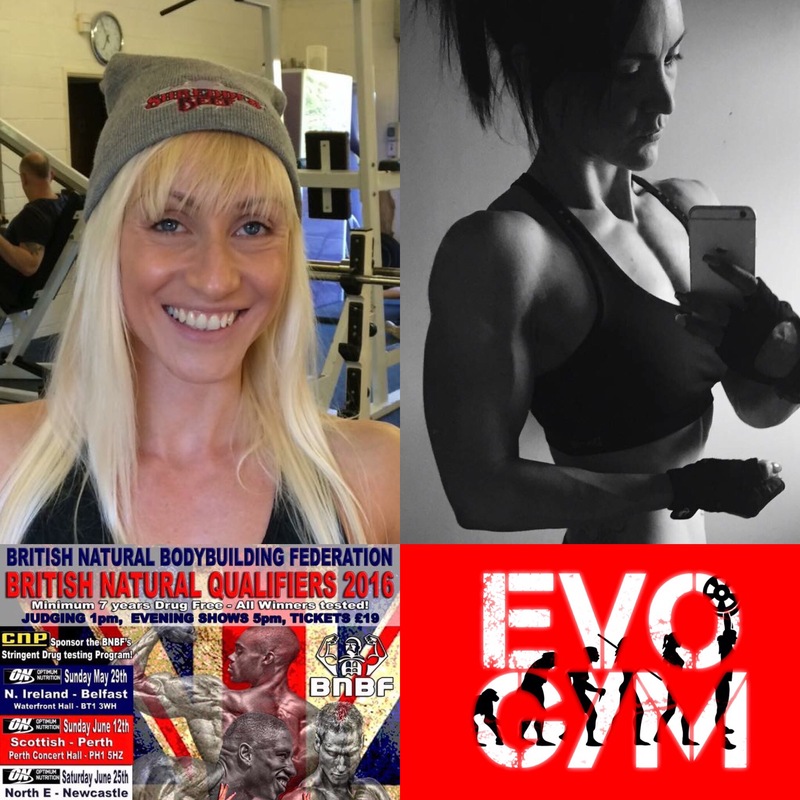 The gym is well represented at the Newcastle BNBF qualifier with Nicky in Physique and Lauren in Athletic. Go gals you rock it!! Total Warrior on Saturday sees Jon, Rachael, Alex and the rest of the team pitting themselves against 30 obstacles and 8 miles of track. The mud should be mudtastic this year so beware of the lost shoes. On Sunday resident mad lady Lizzie along with her mad friend Susan take on the round Sheffield run. 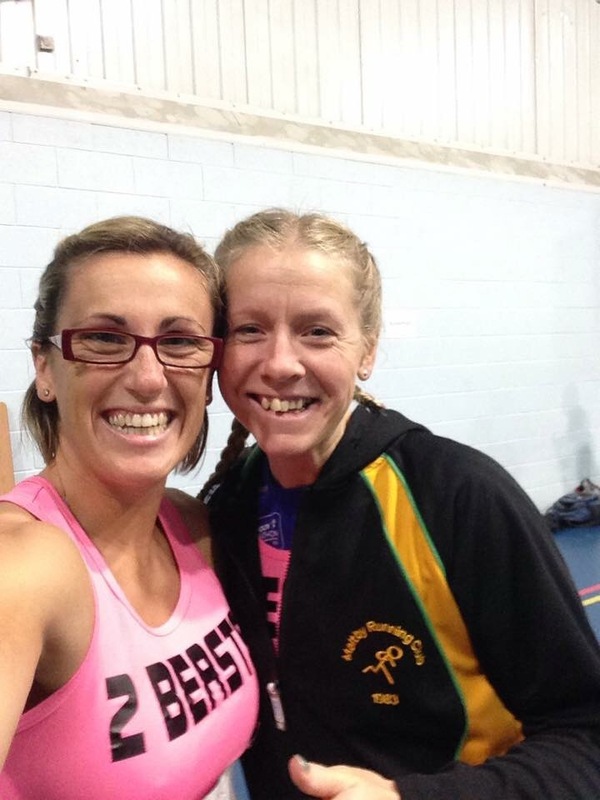 These two are amazing athletes and slightly crazy so watch out Sheffield you are about to be beasted. Let us know what you are up to and we will cover it in the blog. This entry was posted in General, Team Evo and tagged BNBF, round sheffield, Sheffield Gym, Team Evo, total warrior on June 24, 2016 by billybicep. 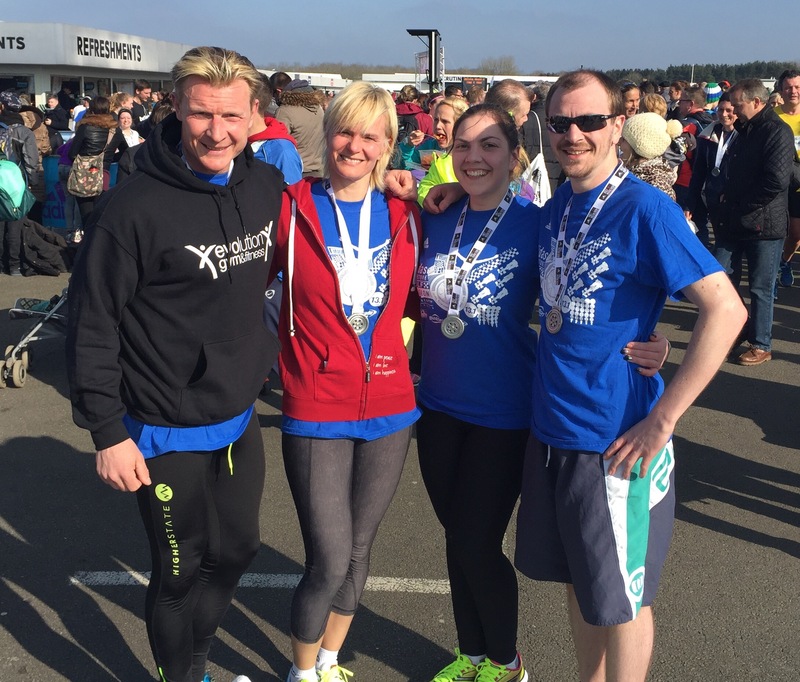 Team Evo were on it once more taking on and completing the Silverstone Half Marathon. 13.1 miles. 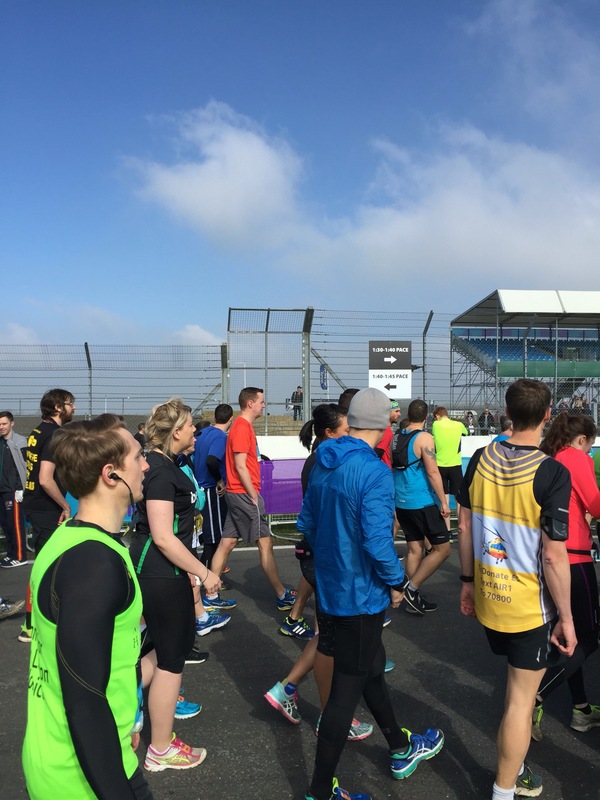 In early March on a foggy morning Rachael, Jon and Hannah made their way to Silverstone home of the MotoGP and formula one. Joined by Hannah’s brother John (confusing) and pit crew Lee. It was cold and very foggy on arrival and all felt a little underdressed for the weather. From the car park the walk to the start was about a mile past garages and businesses that all linked to Motorsport. The start area was buzzing with stalls, snack vans and people, so many people…..
As the start time approached we left the congregation area and opted for the under two hours section. (A wishful thought but we felt we would stand more chance if running with others going at a two hour pace). The start had markers indicating the time you were aiming for and we lined up by the 1 hr 58 board – pushing it but you have to aim high. At about 11 the sun came out and the day began to look up, maybe we would not freeze after all. 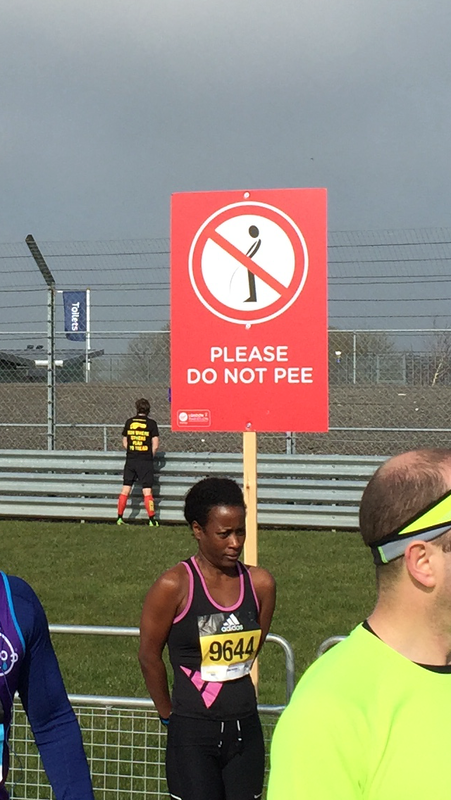 Other signs said no peeing but some people obviously could not read – it gave us all a giggle before we began. As we waited the officials kept asking us to move forward and in the end we were next to the 1 hour 40 board now this was not even a joke – we swapped fears and agreed we could not keep up with the pace maker or other runners in this area. 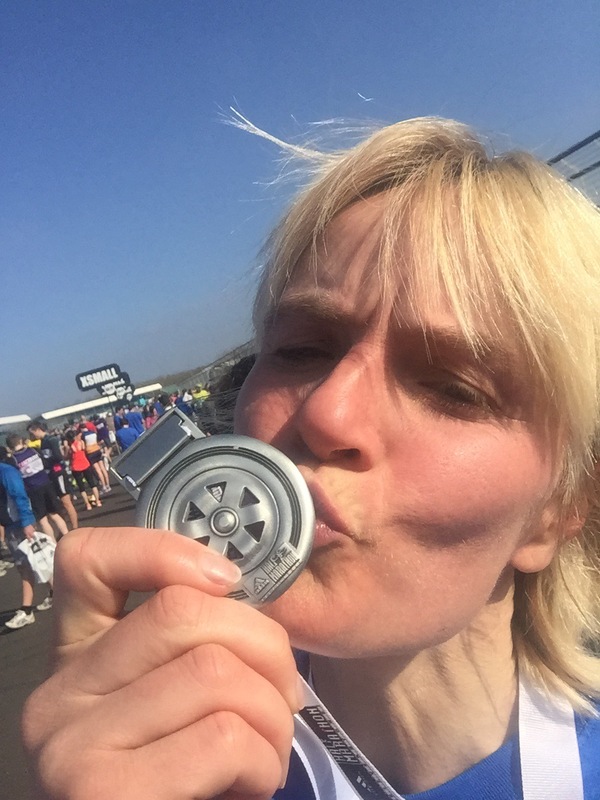 In the distance the gun went off and we were underway – a jalk to the line (half jog half walk) and a beep of the timing chip on my shoe and I had begun my first half marathon. Even though we let the pacemaker run away from us we fair steamed through the first couple of miles. Each mile marker had a clock in it so timing was a breeze. At his early stage it just made me wonder if we had gone off too fast as we were in the low 8 mins for each mile which is much faster then my standard pace. A man bouncing two basketballs ran past and I was gobsmacked by his dexterity and fitness (I am in awe). As the race progressed we past this man a couple of times at the drinks stations when he had to stop but he soon caught us up again. We carried on through the miles Jon and I running together and able to set a pace for the other when we felt tired. We were passed and the rep assets other runners on numerous occasions. At the start I felt like everyone was running away from us but as we toiled through the miles we reeled a few back in. Although our pace slowed a little later in the race we kept all our miles in the low 9 mins or 8 and were on for a good time. Teaching 9 miles I doubted my stamina for another 4 with legs like lead I just concentrated on putting one in front of the other. Some people say they have good periods where running feels great – I did not have one of these it was hard all the way. I was shocked by how far apart the mile markers were and was certain on a couple of occasions that I had missed only to be disappointed when it appeared in the distance. Having only run 10k before the kilometre markers come round so much quicker. The last two miles seemed the longest of the lot and the last one I did not think I could do in the 14 or so minutes I had got to break the 2 hour barrier. In 1 hour 54 mins and about 50 seconds. Awesome and as soon as I had crossed the line the memories of hardship faded away and it was a brilliant experience. Hannah too broke the 2 hour barrier and John was only just over but for a first half marathon we all did amazingly well and were like cats that had got the cream. 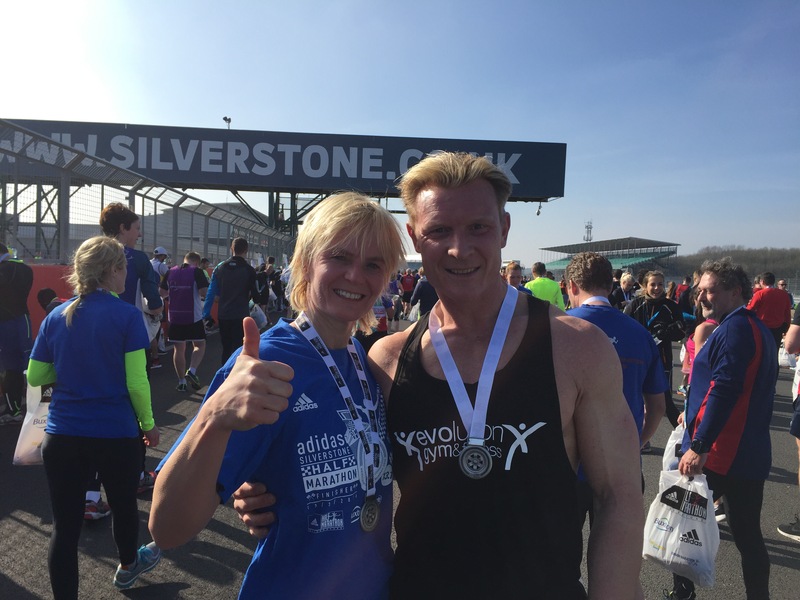 This entry was posted in Fitness, Running, Team Evo and tagged hannah hallsworth, Jon Clark, Rachael Hayes, silverston half marathon, Team Evo on March 29, 2016 by billybicep. We covered clothing in the last prep blog now it’s equipment – you can probably borrow a lot of this stuff if you are not a frequent walker to save you buying something you won’t use. Any small rucksack up to about 30 litres volume should be good, you should all carry your own stuff in case you get separated from your friend etc. Organisation in the bag is important to keep things like waterproofs and drinks handy. We are planning on finishing before nightfall but you never know so we need to be prepared. Get a head torch and some extra batteries you can use them for all sorts of things after the walk. This is a big orange bag that you can use as a waterproof shelter or to keep you warm should the need arise. It’s a survival item and about a fiver. basic first aid kit with scissors, safety pins, triangular banadage etc maybe include some headache tablets, water sterilising tablets etc again it’s a just in case. We will cover this in more detail never the time but we are unlikely to stop for a picnic so food will need to be small nutritious items you enjoy. Drinks are essential to stay hydrated throughout our walk, but it’s important we are fully hydrated before we set off. A small flask with a warm drink is a good idea or isotonic type beverages and water. Whilst there are not any ships on the hills money is always a good idea. You may want to buy food or drink, pay for a taxi or hotel or just phone home. When packing all your stuff in your rucksack give some thought to what you will use most often and pack this near the top. Pack items in a plastic bag if they have a chance of getting wet and / or are delicate. Carry more rather than less it is best to carry it round rather than not have it if you need it. It’s half way though Feb so about 2 months to go – hope the training is going well. 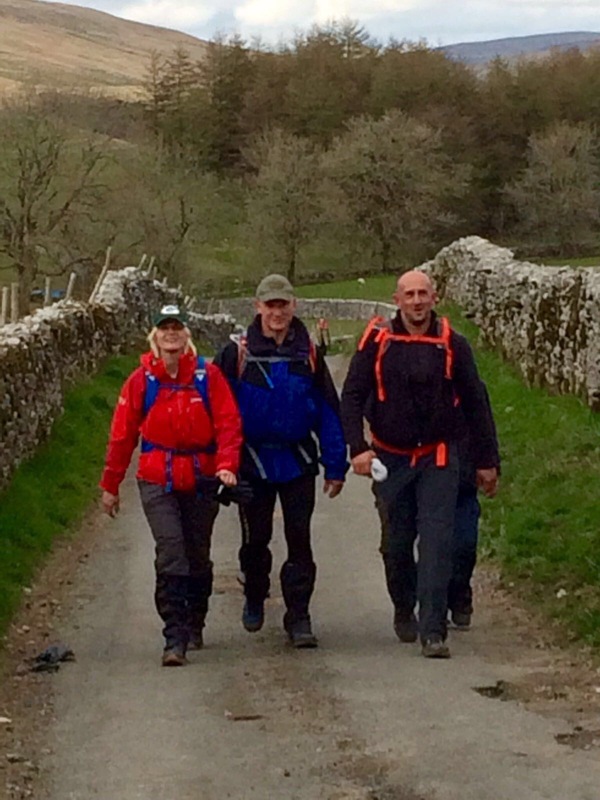 This entry was posted in Fitness, General, Team Evo and tagged Alzheimer's, Hiking, Jon Clark, Rachael Hayes, Team Evo, three peak challenge, three peaks on February 18, 2016 by billybicep. It’s a dark, snowy evening in Sheffield and Jon and I are settled in our seats on Queens Road ready for the NCWA Fight Awakens. 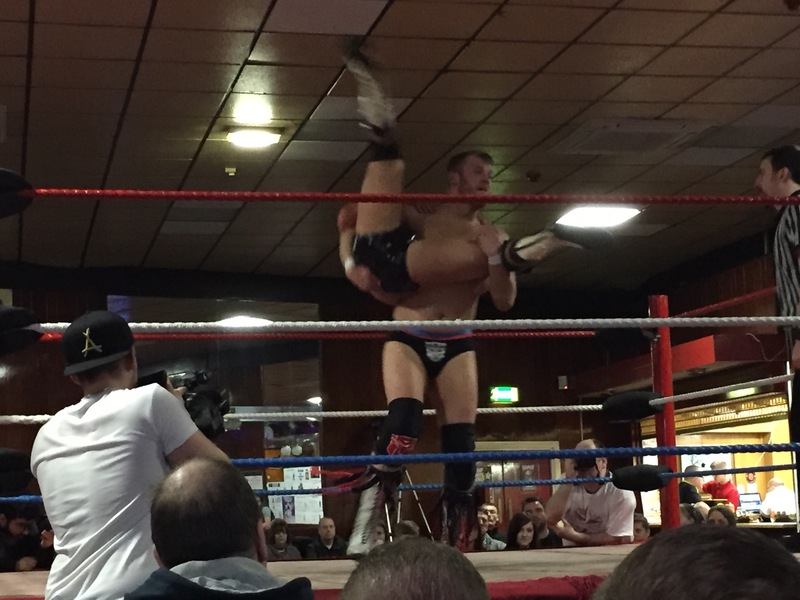 Fighting for Elite British Wrestling is our very own Team Evo member David Deville!! The scene is set it’s a raucous crowd, families and individuals all are gathered for a grappling extravaganza. I haven’t watched wrestling since Big Daddy and Giant Haystacks era. World of Sport on a Saturday afternoon would see my dad ensconced on the settee writhing and punching the air as the giants roared and grappled each other. They threw each other against the corner post and on momentous occasions flew out over the ropes to land in the audience where old ladies attacked them with handbags. I sense a similar atmosphere here – a number of handbags are at the ready. The audience themselves are an eclectic mix of grappling fans of all shapes and sizes. No clue in their image who they will be rooting for. The working men’s club is humming with glitzy curtains and stage, lots of glitter and glitz, a sticky Phoenix nightesque carpet. 2 minutes to show time!!! The show started with a mash of bodies all aiming to qualify for the first competition bout. An elimination it was a confusing mass of bodies for a wrestling virgin like me. Quite quickly the ring emptied as wrestlers got knocked out and we were left with one. Then followed a bout for a belt. The audience (kids especially) were awesome. Constantly shoutig and cheering the competitors. Dressing Gown, dressing gown was a derogatory chant aimed at one of the first contenders who came in with cape, Kylo Ren mask and light sabre. The mutual ribbing of crowd and wrestler made the show, taunts and jeers created the great atmosphere of unity a it all worked because everyone played their part. When David Deville (maybe Cruella’s brother) came to the ring the kids loved it. His shiny pants for the attention of the kids and following a chanting of ‘Plastic pants’ ‘Plastic pants’ he retorted with ‘Pleather!!! !’ Hilarious! 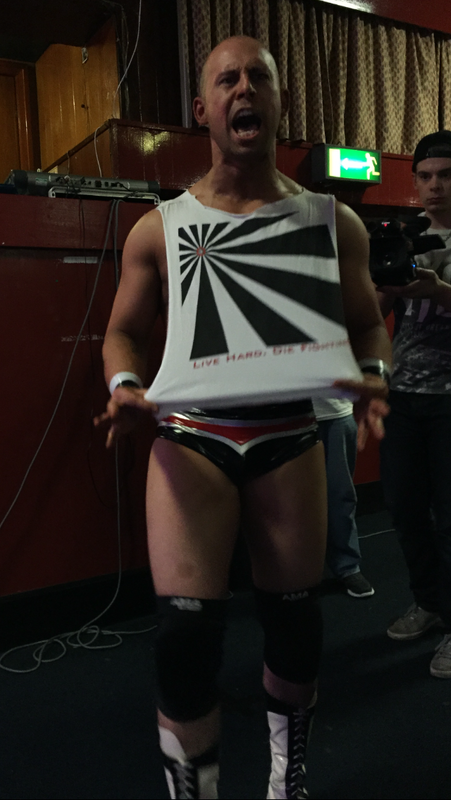 With his Team Evo physique (best in class by far) the standard of wrestling and showmanship was second to none. He was thrown by and threw his opponent as many ways as you think possible – he flew gracefully through the air hitting the floor with a brutality that belies its gracefulness and precision. The whole evening was an amazing spectacle and one that we could all share in. 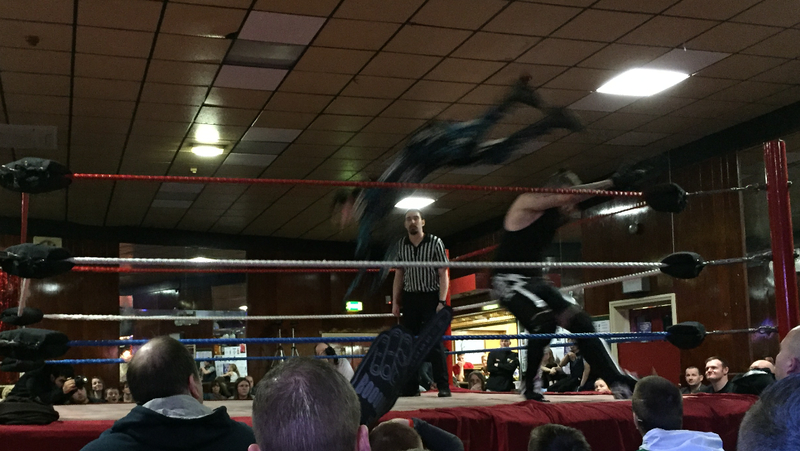 Wrestling is an amazing adventure into showmanship and skill. Although on his occasion David lost his bout to us he was and is a champ of the ring, style, guts and pizazz he’s got it all in abundance. Team Evo just got crazier and we love it. 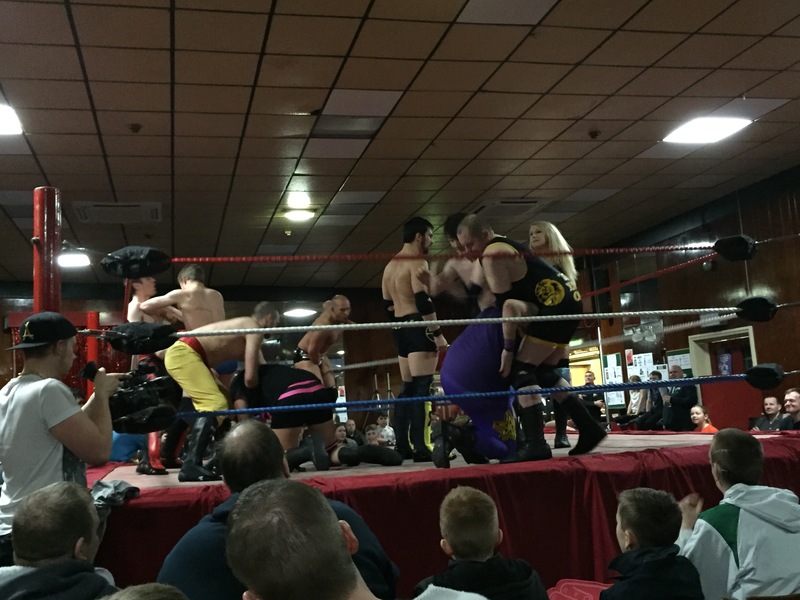 This entry was posted in General, Team Evo and tagged EBW, Elite British Wrestlers, NCWA, Team Evo, wrestling on February 8, 2016 by billybicep. Our challenge takes place on the 24th April 2016 and to make sure we are ready we are going to post a number of prep sheets for your information. Although we will travel and start together everyone will walk at different rates and to stay together as a full group would be extremely difficult. For that reason we are going ask you to buddy up and pick someone or a few people you will look out for. We will also endeavour to give you enough information to make it round on your own, this is not a scare tactic it is prep so that we are all safe whatever happens on the day. To start off with today we will show you the route and then talk a little about what equipment you will need and what to carry with you. As the name suggests we are aiming to walk or hike three peaks in one day (under 12 hours). The three peaks are: Pen-Y-Ghent, Whernside and Ingleborough situated in the Yorkshire Dales (Gods Own County – so they say). Each has its own personality and challenges but together they are a formidable beast. This is going to give each one of us an amazing feeling of accomplishment not only from raising funds for the great cause that is the Alzheimers society but from completing a gruelling physical and mental challenge. Nothing worth doing is ever easy!! You will need to know the route and be able to follow it in a guide book and/or on a map. If you cannot see the walkers in front you will need to know where to go so first things first get yourself a map or route guide. I will add some details of where to buy and prices soon. It is quite a busy popular route so no doubt we will see others on the way and be able to ask if we are unsure, but just in case learn it. So as a walker what do you need? Thermal shirt or fleece jacket – this is your mid layer. the more ventilation options the better but a zip up or button up fleece (half way at least ) should be ok. This will give you warmth on a cold day – we are going in April – but also allow you to ventilate and cool down on the harder bits of the walk. Waterproof Jacket – the outer shell – the best waterproof jacket you can afford the better – get some advice at your local walking shop but this layer will keep you dry on a wet day and stop the wind that can get quite harsh on the summit and higher levels. Walking Trousers or leggings – Trousers are any slacks or bags designed for walking, leggings are such as Ron Hill or stretchy leggings – JEANS are NOT an option. Waterproof Overtrousers – any kind of synthetic overtrousers that offer some protection are acceptable. If it rains all day you will be thankful for them. Walking boots – Any kind of boots specifically designed for walking are suitable. Do some practice in them, do not use brand new boots on the three peaks challenge. Hat & Gloves – it is worth a selection – it gets cold at the top and its important to keep your hands and head warm. Walking Socks – take advice again on the best socks but ones that allow your feet to breath and avoid building up sweat are best. this is the profile of the peaks we will climb not necessarily in this order…. This entry was posted in Fitness, General, Team Evo and tagged alzheimers society, Evolution Gym Sheffield, sheffield, Team Evo, three peak challenge, yorkshire dales on January 27, 2016 by billybicep.